My mini-documentary of my childhood hero, a great American legend who was a combination Mark Twain/Richard Prior & Michael Jordan: Leroy Satchel Paige, born July 7, 1901, then again in 1903, 1904, and finally in 1909. 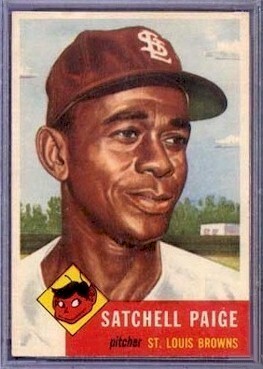 When I was seven I fell under the spell of Leroy Satchel Paige. I don’t remember who he was playing for, or who he was pitching against, I only remember Satchel – ridiculously old, impossibly leanlanky, and sooooooo slooooooow as he jangles in from the bullpen with the bases loaded and two out. As the crowd whips itself into a frothy frenzy, I’m hypnotized by this magical man, this cross between Ichabod Crane and Rip Van Winkle. Those long, loping, can’t start the game without me strides are comical, but they’re also majestic: King and Jester, Warrior and Clown, an ageless wonder of the world. Well, by the time the Ol’ Satch actually reaches the mound and warms up, the whole stadium erupting all around him, the poor dumbfounded flummox of batter looks like a balloon with the air all leaked out of it. Sure enough, Satch goes into his syncopated, whirly bird, interpretive dance, scatty jazzy be-bop of a wind-up, swinging out that long lean leg and easy as you please, his arm whipshotting a teeny tiny pea homeward, the whippersnapper batter freezes like a duck on a winter pond. “STEEEEEE-RIKE!! !” screams the ump, as strike one caresses the paint on the outside of home plate lightly like a long lost lover. Let the ball flow our of your hand like water. “STEEEEEE-RIKE!! !” screams the ump as strike two strokes the inside of home. Just take the ball and throw it, home plate don’t move. Same wind-up, same whipshotting right arm, only this time the ball floats slow, slower, slowest, the snailiest change of pace I’ve ever seen: Uncle Tommy. Uncle Tommy’s slow, but he gets there. The hapless whippersnapper waves feeble before the ball even gets there, his Louisville Slugger transformed into an overcooked 33 ounce piece of linguini. “WOO-HOOOOOO!” the crowd screams in full-throated roar, raining down thunderbolts of joy on Ol’ Satch as he saunters off with a doff of his cap. Black and white, sons of Klansmen, and ancestors of slaves, all raised their voices as one with me, and I understood in a way I could not express at the time that Satchel had made us all color blind. And happy. From that minute on, he was my hero. As I got older I discovered Satchel’s humor. Age is a question of mind over matter, if you don’t mind, it don’t matter. And his brilliance: Nolan Ryan holds the record for no-hitters with an extraordinary 7. Satch threw 55. Cy Young: 511 wins, Satchel, 1,934. Shut out the Red Sox for three innings. When he was 60. Or somewhere thereabouts. I memorized Satch’s 6 rules for staying young. Avoid eating fried meats, they angry up the blood. If your stomach disputes you, pacify it with cool thoughts. Keep the juices flowing by jangling gently as you move. Go very light on the vices such as carrying on in society, the social ramble ain’t restful. Avoid the running at all times. And of course, don’t look back, something might be gaining on you. Baseball has turned me from a 2nd class citizen into a 2nd class immortal. And as I got older, I understood his humanity. When I found out he was the highest paid athlete in America in 1945, I started to think about what it must have been like to be the Tiger Woods of your day, but not get to compete in any PGA events because you’re black. To have to watch from the sidelines as the best white players get riches and glory, while you’re denied your rightful place on the center stage of America. But they didn’t have Air Satchels back then. The NO COLORED ALLOWED sign was still hanging over the door. I marvel at this man I idolized as a boy, and how he triumphed with such grace, humor, and dignity over decades of bigotry and intolerance. But nothing will ever match that tingly feeling of the six year-old boy moonstruck by that great artist of the diamond. Satchel, I is with you.